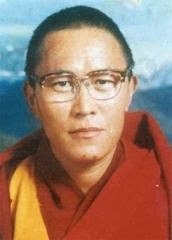 Tenzin Delek Rinpoche, of Tibetan descent, was detained on April 7, 2002, by the Yajiang County Public Security Bureau, and falsely charged as the “mastermind” behind a bombing in Tianfu Square in Chengdu, the provincial capital China’s southwestern Sichuan province. On Dec. 22, 2002, the Garze Prefecture Intermediate People’s Court sentenced Delek to death with a two-year stay of execution. In 2005, his sentence was commuted to life in prison (Editor’s note: suspended death penalities are usually commuted to life in prison, unless the prisoner is alleged to have committed a crime in the first two years of his sentence). Delek served 13 years of his sentence, during which his health rapidly deteriorated. Sadly, Delek passed away in prison in Chengdu, Sichuan, on July 12, 2015. His cause of death is currently unknown. In 2009, more than 40,000 Tibetans signed and finger-printed a petition calling on the central government to retry Delek’s case. Delek was born 1950, in Lithang County, Tibet.